Technical Examination Centre, etc. Author of "Up-to-Date Dresscutting and Drafting," also "The Practical Work of Dressmaking and Tailoring." To make the pocket, cut two pieces of lining rather wider than the opening and the depth the pocket is to be, and face the top of one piece on the right side (about three inches down) with a piece of the cloth; this is to prevent the lining showing through the opening. N.B. - If a circular pocket is being made in a coat, the lining must, of course, match that of the coat. Place the piece of lining which has been faced, wrong side uppermost, on the wrong side of the cloth, with the facing over the opening, the facing to be towards the top of the opening; tack it in this position along the top (as near as possible to the curved line) to the piece of linen, and machine-stitch it to this, but not through to the cloth representing the coat. Take the second piece of lining which is to form the pocket, and place it wrong side uppermost, with the edge to the lower edge of the linen, and the pocket piece facing upwards. Tack and stitch this to the lower edge of the linen, and as near as possible to the curved line; but do not stitch through to the cloth. Turn both pieces for the pocket downwards, and stitch them together all round, but no stitches must be taken through to the piece of cloth, representing the coat, in which the pocket is being made. Take a small piece of linen and hold it under one corner, on the wrong side of the pocket, and fix it firmly in this position by "private stitching" it through from the right side of the piece of cloth (or coat), prodding the needle up and down several times. Do the other corner of the pocket with a small piece of linen* in the same way. These small pieces of linen are stitched under the corners to strengthen them, and to prevent the pocket stretching out of shape with use. From the right side of the piece of cloth (or coat) "private stitch" round the top curve of the opening right through to the pocket. If this is not done a "flap" will be found at the top of the curve when the tacking (illustrated in diagram No. 4, Part 4), which keeps the two edges of the opening together, is removed. In making a coat it is better to leave the opening of the pocket tacked across until the coat is quite finished. N.B. - Private stitching is always done by hand, with some of the same kind of silk with which the machine-stitching has been done. and each stitch must be worked over a machine-stitch, so that it may appear one with it and not show; it is because it must be invisible that it is called "private stitching." It is used to fix the corners of pockets, or any part which has been previously stitched (for ornament), but requires to be fastened down securely and invisibly. A "roll collar" is cut, worked, pressed, and then put on to the coat and "faced"; the "revers" are cut in one with the fronts of the coat, but as the worker has not yet learned to make a coat, the collar and revers (like the pockets) can be made for practice on a piece of cloth. A good guide for the length of the collar is the size of the neck (measured round the base) plus one inch - e.g., if the neck measure is 14 inches, the collar should be 15 inches long, and 3 or 3 1/2 inches deep. Take a piece of French canvas, and measure about eleven inches along the selvedge, and make a mark. and about II inches along the cut edge make another mark. 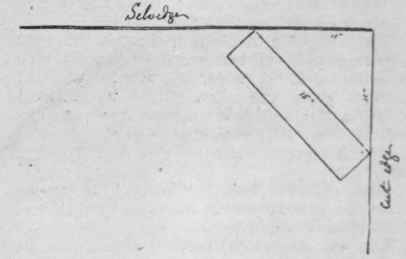 Place a tailor's square across the corner of the canvas from one mark to the other, and draw a line with a pencil or piece of French chalk; on this line measure and mark the 15 inches (for the length of the collar), and from each end of the line measure and mark 3 or 3 1/2 inches for the depth of the collar. Place the square from one mark to the other, and draw a second line parallel to the first and 15 inches long, and connect these two lines by two short perpendicular lines (as in diagram No. 1). This gives the net size the collar is to be when finished. The canvas must always be cut exactly to the measurements; no turnings are needed or must be allowed. N.B. - If the collar is being cut from a small piece of canvas from which the selvedge has been removed, great care must be taken to cut the collar perfectly on the -cross, or it will not set. Diagram 2. Herringbone down the raw edges together, provided the joins are all made on the straight; the raw edges are placed one over the other and herringboned down, as shown in diagram No. 2. Instructions for herringboning were given in the Dressmaking lesson in Part 3, but in joining the pieces of canvas together the stitches must be taken through the two folds to secure them firmly together. Cut out the crossway piece exactly on the lines, make a mark at the edge of the canvas at half its length, from this mark measure 1 inch or more, up, and make another mark; this gives the depth for the "stand" of the collar. Measure from each end 2 inches or less, make a mark, and draw a curved line from it to the mark, which is 1 inch (or more) up, at the centre. Fold the canvas in half - with the curved line outside - and trace through it to the under half with a tracing-wheel; this ensures the two halves being exactly alike. Cut a small piece off the canvas at the ends (from the mark at 2 inches from the end), taking off about a quarter of an inch of the depth of the collar, unfold the canvas, and draw over the traced line to perfect the curve. The canvas is now ready to be put on to the cloth; the underside of the collar must be done first. Place a piece of cloth to match the coat (when a coat is being made) wrong side uppermost on the table, and put the piece of canvas (with the curved line uppermost) along, and about half an inch from, the cut edge of the cloth; tack them together loosely along the centre with three or four stitches only. N.B. - If the cloth is "faced," the canvas must be tacked to it so that the "face" will smooth downwards. Cut out the cloth, leaving about half an inch all round beyond the canvas for turning. (see diagram No. 3). This row of running stitches divides the "stand" from the "fall" of the collar, and the tightness prevents the back of the collar stretching and standing out from the neck of the wearer. Padding is a stitch used in tailoring to secure canvas to cloth in collars, revers, etc., and to make them "roll"; also to keep two pieces of canvas together to interline and stiffen fancy collars, revers, cuffs, etc. N.B. - Great care must be taken when padding to hold the work correctly, or the shape of the collar or revers will be spoiled. The work must be held over the finger the whole time, lengthwise of the collar or revers, thus allowing the canvas to become longer than the cloth which is underneath, and making the collar or revers " roll." The edges of the cloth must next be turned down over the canvas, and neatly tacked near the edge all round. All superfluous cloth must be cut away at the corners, so that they may lie perfectly flat.